is now located at 6033 Monona Dr. Drums n' Moore offers lessons of all types at our in-house School of Music. You can learn any instrument from Drums, Percussion, Piano, Acoustic and Electric Guitar, Bass, Woodwinds, Brass, Stringed Instruments and Vocals. Our expert staff can teach anyone from beginner to professional. Lesson Prices - Call (608) 222-3786 for lesson rates or e-mail us for more info. 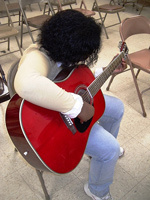 Guitar Rentals - Electric or Acoustic guitar rentals are available per month and include everything you will need to start playing right away. Each studio is designed to be spacious and comfortable. Teachers are given their own space. Students have the opportunity to play on the latest equipment, and parents are able to relax in the comfort of our lounge. (608) 222-3786 with your questions or to schedule lessons. Once a student applies to Drums n’ Moore for lessons they will be contacted by the Lesson Coordinator for a brief interview. The student will then be matched with the most compatible teacher for their musical goals.